Owls are birds with big round heads and flat faces. Owls have brown, gray, black, and white feathers. Owls live almost everywhere in the world. Many owls live in woodlands. Woodlands are covered with trees and shrubs. Some owls make nests in trees. Owls have sharp, curved beaks. Owls have big eyes that face forward. Owls see well at night. Owls catch food with their sharp claws. Most owls hunt for food at night. Some owls hunt during the day. 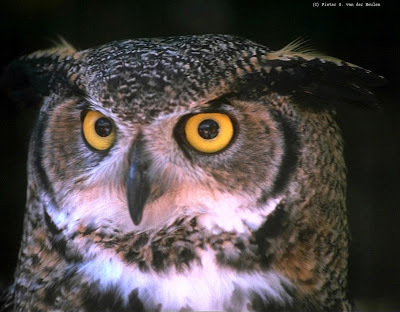 Owls hunt and eat frogs, insects, mice, and other small animals. Owls sometimes swallow their food whole. Most owls sleep during the day.